Can the Pope Keep Hispanics in the Catholic Church? The Spanish-language service at the Roman Catholic Saint Elizabeth church in New York City attracts a crowd, even midweek. Many of the church's members are new immigrants from majority Catholic countries in Latin America. A recent study found that almost 90 percent of Hispanic Americans have a favorable opinion of Pope Francis. The leader of the Roman Catholic Church will visit the city this week. Sister Celia Cid says Pope Francis, a son of immigrants, understands the needs of Hispanic Americans. "He identifies with the struggles on many different nationalities, different countries and what they are going through," she said. "It's a great hope for me to have him come because this city is a melting pot. It is a city built on immigrants." But almost 25 percent of Hispanic Americans are now former Catholics. Some leave for evangelical and Pentecostal churches. 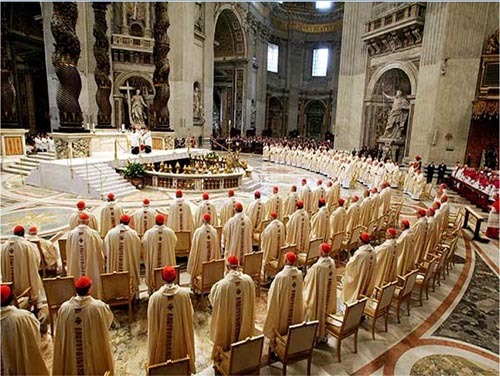 Others just slowly withdraw from the Catholic Church. Father Ambiorix Rodriguez is an immigrant from the Dominican Republic. He was raised in Manhattan where he is now a priest. Father Rodriguez told VOA that Pope Francis has an answer. He said the Pope advises Catholic spiritual leaders to go out and connect with people outside of the church building. "He is telling the church we can no longer stay inside, self-enclosed, worrying about who we have, who is here, but no, the church needs to go out," Father Rodriguez said. Young adults make up the largest group of Hispanics leaving Catholicism. Today, many people under the age of 30 describe themselves as religiously unaffiliated. Alias is a young Catholic Church member who is invigorated by the Pope's openness. He said, "If the Catholics who have drifted are based on ‘Oh, you don't understand me,' or 'It's too complicated,' or 'I'm tired of traditional habits,' the Pope is actually saying, ‘You know what? I am moving forward.'" Alias also said the pope's use of social media to connect with the next generation is one way he is keeping young people invested and interested. Pope Francis is the most-followed world leader on Twitter, a popular social-media site. His user name is @Pontifex. "The youth are the future people of tomorrow. They are ones who are going to keep this church alive," Alias said. "If the youth are not being influenced or moved by it, you're going to lose a lot of members because it starts there," he said. The Pew Research Center study says that almost 33 percent of American Catholics are Hispanic. The study also found that Hispanics are leaving the religion at a high rate. In 2010, 67 percent of Hispanic Americans identified themselves as Catholic. By 2013 that percentage had dropped to 55 percent. It comes a week before the government releases first-ever economic data that will show more Hispanics, elderly and working-age poor have fallen into poverty. The general consequently promised to withdraw his troops speedily from Mexico. They live in tight little self-enclosed worlds. As cold as it was, I suddenly was invigorated thinking about how wonderful this extreme cold really was. 1. "He identifies with the struggles on many different nationalities, different countries and what they are going through," she said. "It's a great hope for me to have him come because this city is a melting pot. It is a city built on immigrants." With someone I love I can go through all the hardships of life together. Do you know which channel to go through? 2.Young adults make up the largest group of Hispanics leaving Catholicism. Today, many people under the age of 30 describe themselves as religiously unaffiliated. They'll do all they can to make up the economic losses. If you do not use make up, now is the time to begin.